On May 26, in a lecture in Physical Science Lecture Hall, Wiener shared some of his story as well as details from some of the papers–ranging from song lyrics to a suggested narcotics arrest–the FBI had claimed to be a threat to national security. In his lecture, Wiener explained that the failure of the FBI to release these documents was a violation of the Freedom of Information Act. This act, passed in 1966, allows for public access to government documents upon request. Wiener called this measure "a great law in principle," adding that there are exceptions in which some documents can be withheld. However, in 1997, then–U.S. President Bill Clinton passed the Openness Initiative, which provided provisions for the release of most of the documents for which Wiener was fighting. In his presentation, Wiener showed reproductions of the released papers before and after the 1997 court decision. One document was completely blacked out, aside from the date and Lennon’s name. After the Openness Initiative was passed, there wasn't much change. "They just gave us a whole lot more stamps," Wiener said humorously. However, other pages that were released proved to be a bit more elucidating. 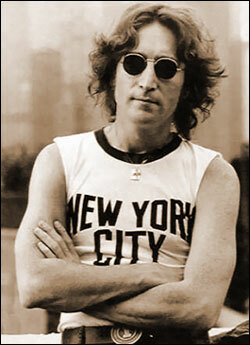 One such page contained the lyrics to the John Lennon song "John Sinclair," which Lennon printed on the back of an album and sang at a concert. Another document which was completely blacked out before the decision contained a description of a talking parrot who had learned to squawk, "right on!" when a conversation started to get rousing. These are the same documents that the FBI filed as classified and refused to release because they were a "threat to national security." "[These documents] were not a danger to the security of the United States, and they should be released," Wiener said. Some of the other documents released to Wiener contained information regarding the request of FBI agents to arrest Lennon on a charge of narcotics possession. Wiener explained that the documents are evidence of the government's attempt to "silence a critic of the president," since they dated back to the Richard Nixon administration. John Lennon rallied against this administration and tried to persuade many young people to vote against Nixon and the Vietnam War. Grzegorz Korzeniowski, a fourth-year biological sciences major, thought the lecture was interesting. "I was surprised that the government could do such things … that they could get information about you [by any means]." In an interview after the lecture, Wiener said that an interest in the anti-war movement first compelled him to begin his research on the Lennon FBI files. "This raises the question about the government’s stance toward critics," Wiener said. "I think it shows government misconduct and abuse of power." "[Lennon] thought of the United States as the land of the free," Wiener said. However, Wiener’s presentation outlined one outstanding case of government abuse of power in the United States. "The full power of the American government could be focused on one man," Wiener said. Although laws like the FIA do exist, Wiener had to endure a 20-year legal battle in order to utilize the rights granted in that statute. Through his lecture and his book "Gimme Some Truth: The John Lennon FBI Files ," Wiener suggests that we as citizens need to be skeptical. "This is not a happy story," Wiener concluded. "But it's an American one." LOS ANGELES (AP) -- The FBI must turn over the remaining secret files on Beatle John Lennon to a professor who has waged a more than 20-year legal battle to get the documents, a judge ruled. U.S. District Judge Robert Takasugi rejected government arguments Tuesday that releasing the last 10 pages would pose a national security risk because a foreign government secretly provided the information. The government was not publicly identified. Jonathan Wiener, a professor at the University of California, Irvine, sued the U.S. government for the documents in 1983 under the Freedom of Information Act. He received 248 pages in 1997 as part of a settlement. The previously released files, which were gathered from 1971 to 1972, include memos detailing Lennon's donations to a group planning to demonstrate at the 1972 Republican National Convention. But they contain no allegations Lennon was involved in planning or committing illegal acts. Wiener, a historian, originally sought the files for his 1984 book, "Come Together: John Lennon in His Time ." 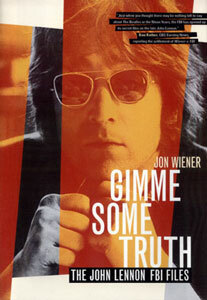 After the 1997 release, he wrote "Gimme Some Truth: The John Lennon FBI Files ." His battle with the government went all the way to the U.S. Supreme Court.